I’ve been on a pasta craze these days. The only thing better than pasta is pasta with a glass of red wine. And the only thing better than pasta with a glass of red wine is pasta with a glass of red wine and a piece of homemade garlic bread. Garlic bread has a nostalgic quality that instantly transports me back to spaghetti dinners as a child. It’s a food with good vibes. Let’s create some beautiful carb magic. 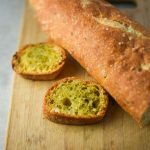 This vegan garlic bread recipe is simple. The only difference from a non-vegan version is that the base fat is olive oil instead of butter. It’s also chock full of garlic (two whole heads! ), but fear not, the garlic is roasted so you’re not going to emerge breathing garlic fire on everyone around you. Try pairing with vegan stuffed shells, creamy avocado pasta, or mushroom lentil soup. 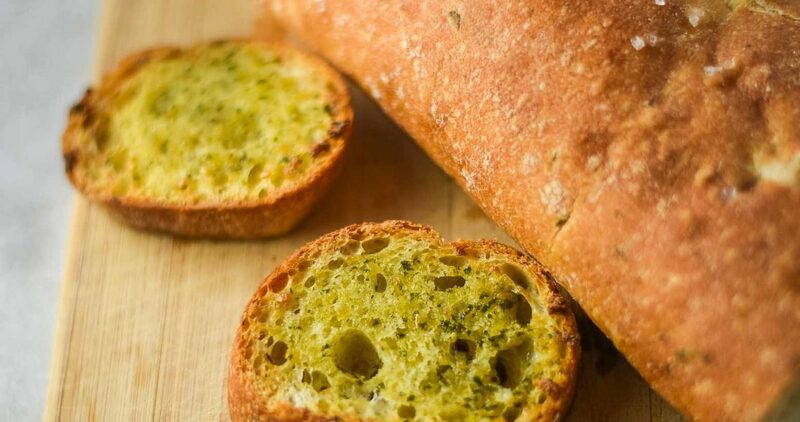 This garlic bread recipe would also be good to dip in tomato soup on a rainy day. Trust me, I live in Seattle. I’ve got my perfect rainy day pairings on lockdown. 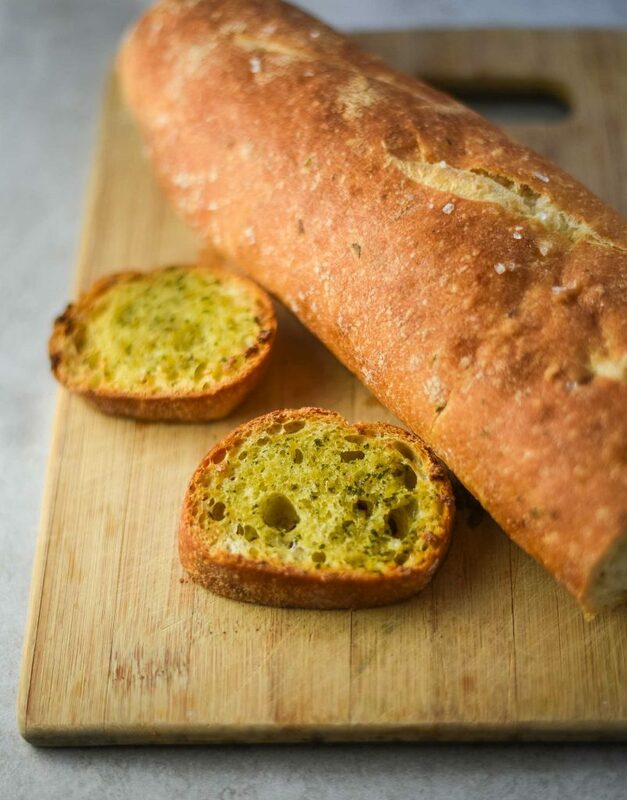 Tasty vegan garlic bread with roasted garlic, fresh basil, and olive oil. Perfect for pairing with pasta or soups. To roast garlic, preheat oven to 400 degrees F. Remove two raw garlic cloves from one bulb and set aside. Cut the bottom off of garlic bulb, so each clove is exposed. Wrap each bulb loosely in foil and drizzle with olive oil. Roast until garlic cloves become fragrant and begin to brown, about 20-30 minutes. Once browned, remove garlic from oven and let cool. When bulbs are cool enough to handle, you can squeeze each clove and the roasted garlic will pop out. Add roasted garlic, raw garlic cloves, olive oil, basil, salt, oregano, and red pepper flakes to small food processor. Blend on high until smooth. Add additional salt, basil, red pepper flakes, or oregano as desired. 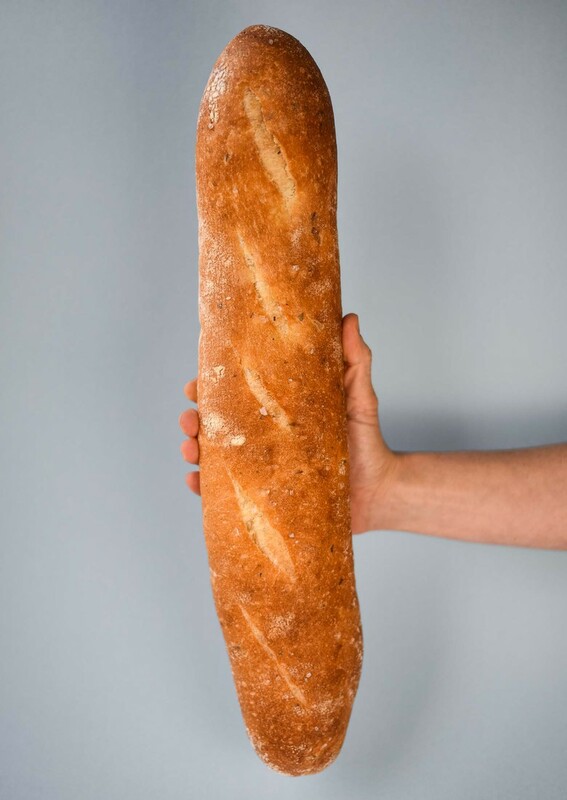 Slice loaf as desired. You can either do individual horizontal pieces or cut down the length of the loaf and split it in half. Slather one side of each slice of bread with the garlic oil. Place the bread on a cooking sheet and bake garlic side up for about 10 minutes, or until crispy. If you want extra crispy garlic bread, you can broil for 1-2 minutes before taking out of oven. Be sure to keep an eye on the bread if you broil so you don’t burn it. *Recipe is a guide. Adapt ingredients and measurements as desired. Adapted from Connoisseurus Veg’s Vegan Garlic Bread.